If you’ve spent more than a couple of minutes with me over the past couple of years, you’ll know that I am a passionate supporter of Fair Trade and that I have been working with the EWB Vancouver Professional Chapter and Fair Trade Vancouver to help raise awareness and increase demand for Fair Trade products. Earlier this week I had the opportunity to visit Kuapa Kokoo in Kumasi, which is currently the only Fair Trade cocoa cooperative in Ghana. It is massive with 62,000 members spread between 1,300 societies (communities) across five of the six cocoa growing regions in the country. 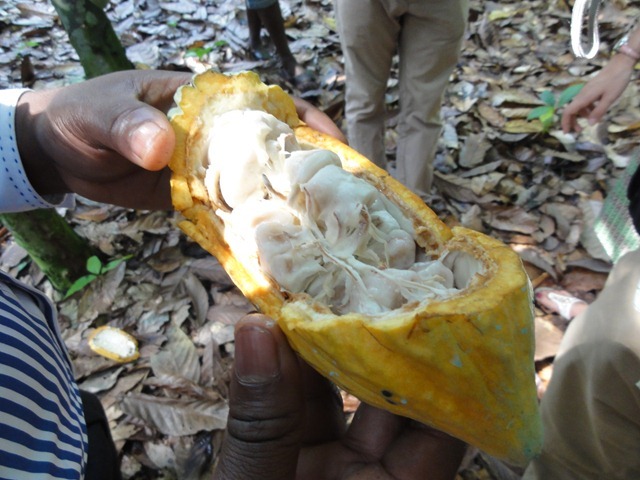 Although most Canadians eat chocolate or other cocoa products almost every day, very few could identify a cocoa pod or cocoa beans (above left). Conversely chocolate is pretty hard to come by in Ghana despite the fact that Ghana is the second largest producer of cocoa behind neighbouring Ivory Coast. 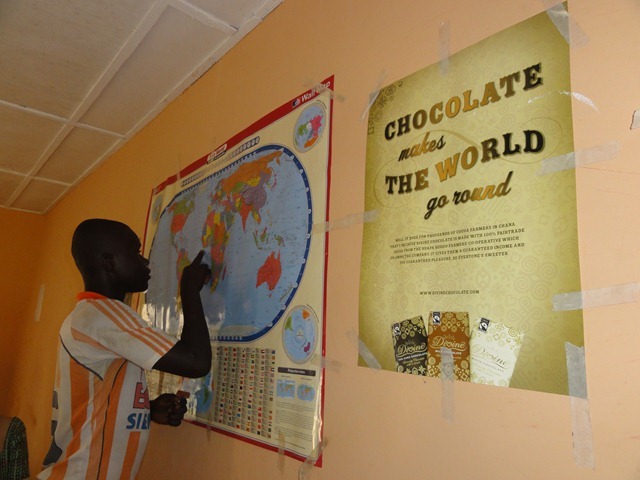 The poster in the picture on the right above is from Divine chocolate and it hangs next to a world map in a new school that was built with Fair Trade social premiums. The school is in the village of Amankwatia located in the Offingo district about a half hour’s ride from Kumasi. This village is home to the Kuapa Kokoo member society that our EWB group had the opportunity to tour. Although none of the children who attend the school have tasted Divine chocolate and many will never have tasted chocolate at all, they all know how important it is to them and their families. 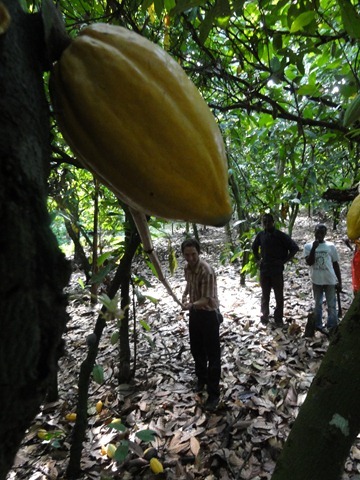 The average cooperative member is a smallholder farmer with between 5 and 10 acres of cocoa trees. Based on some rough calculations and from observations of the living standard in the village we visited, these farmers and their families are living in the $1-2/day income level range. This was somewhat surprising to me, as a common knock on Fair Trade back home is that it doesn’t help the poorest farmers. That’s certainly not what we observed in our, albeit brief, visit. Another common knock on Fair Trade is that the cost of initial certification and ongoing monitoring is a major barrier that prevents many farmers from benefiting. Although this could be the case for small new prospective cooperatives, it is not a factor for Kuapa Kooko because it’s significant size spreads the fees out to the point that they are negligible for individual members. Annual dues for its members have just been raised from 20 peswas to 1 Cede per year (about $0.80 Canadian). This is a small amount even for a Ghanaian farmer. The cooperative has a constant lineup of new farmers wishing to join. They have an on-boarding process and have to limit their membership growth based on the growth of their organizational capacity. The cooperative offers skills development and training programs for the farmers with respect to cocoa farming and processing, but it also extends this support to other livelihood diversification activities as well. For example: in some societies women turn the cocoa pod husks into local soap. In 2000, the cooperative formed the Kuapa Kokoo Credit Union to provide loans to members to help them explore and expand new businesses. Cocoa trees take three or four years to grow originally, but then can produce on average around 100 cocoa pods per year for the next 70 years or so if they are properly maintained. There are two growing seasons each year, a major and minor one, and most farmers have to engage in other activities throughout the year or during the off season in order to ensure their food supply and income. Although the revenue from growing cocoa can be relatively good compared to other crops, this is offset by a high cost of chemicals and other inputs. Cocoa farmers are forced to treat their farms as businesses in order to properly plan and save. After harvesting the pods and extracting the cocoa seeds (see pictures above), the seeds are then put in a pile in the forest and covered with banana tree leaves to ferment for around five or six days (below left). From there, they are moved to drying tables where they are dried for several days (below right) before being put into 64kg bags which are sold to the cooperative and moved to collection depots. Cocoa is Ghana’s largest export and it has and continues to play a central role in the country’s economy. The Ghanaian Cocoa Board regulates the industry and certifies all cocoa buyers. There are currently 20 licensed buyers, of which Kuapa Kokoo is the only one that is Fair Trade certified. 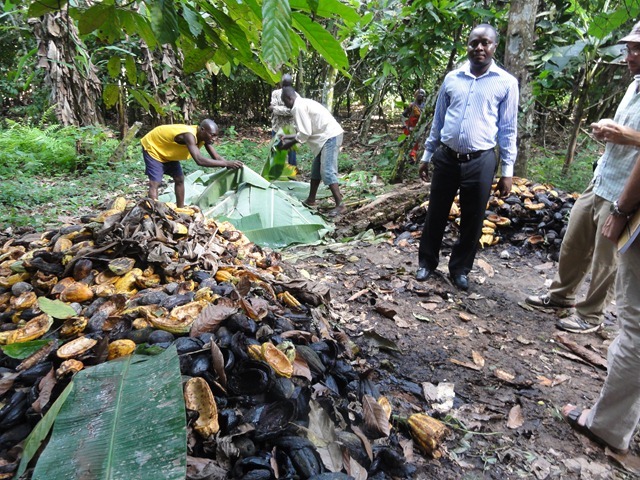 The Cocoa Board sets the price that is paid to farmers for all Ghanaian cocoa – fair trade and non-Fair Trade. This shields farmers from fluctuations in world market prices, which are quite high at the moment (roughly $2,800/tonne – well above the Fair Trade minimum of $1,600/tonne), but are historically cyclical and regularly dip painfully low as well. For the portion of Kuapa Kokoo’s output that they are able to sell as Fair Trade, the farmer societies also receive the social premium of $150/tonne. These premiums are aggregated and shared amongst all of the cooperatives members. Ghana supplies around 700,000 tonnes of cocoa and Kuapa Kokoo is around 4% of Ghana’s total at 30,000 tonnes/year (total world supply is roughly 3,600,000 tonnes) . Until recently, Fair Trade cocoa has been a small percentage of total world supply, hovering at around 0.1%. This small Fair Trade segment has been dominated by Kuapa Kokoo and a Fair Trade cooperative in the Dominican Republic called Conacado, but more significant Fair Trade cocoa grower cooperatives are now developing as demand for Fair Trade increases. This is the cheer of the cooperative. It speaks to the pride that the members of the cooperative feel. According to the people we spoke with, the requirements of Fair Trade certification gave them the impetus to put in place excellent management that sets them head and shoulders above the other licensed cocoa buying companies in Ghana. This pride is rooted in the quality of Kuapa Kokoo cocoa, which is widely recognized to be superior. The government Cocoa Board has a quality control division that rates all cocoa in Ghana before purchasing. Kuapa Kokoo brings in these government inspectors but also maintains it’s own higher standards and may reject cocoa that meets the government set standards. Unfortunately over the past 17 years Kuapa Kokoo has typically sold less than 10% of its total production as Fair Trade certified and thus the social premiums available to reinvest in the community has been limited. If they were able to sell their entire current production of 30,000 tonnes as Fair Trade, they would have $4,500,000 to spend as a result of the $150/tonne Fair Trade social premium. This is a huge amount of money in Ghana – especially when it flows directly to those in need. With the social premiums that have been available (on average about $100,00o/year for the years before 2008), the cooperative has awarded 320 projects based on the needs of their member communities. These initiatives include: water bore holes, schools, school materials, communal milling machines, and sanitary facilities. Decisions regarding the selection and allocation of projects to specific villages are by the farmers themselves through the democratic structures of the cooperative. The cooperative, acting within the bounds of its Fair Trade certification, also sometimes decides to pay a portion of its profit as cash bonuses or in the form of purchased implements for farmers (last year they decided to buy every farmer a machete). When you ask the average person where chocolate comes from they generally respond Switzerland or Germany. They’re right – sort of… The process of turning cocoa into chocolate by adding milk, sugar and other ingredients is complicated and dominated by a few major companies. It is also very focused on achieving hardness, which makes warm places with poor infrastructure for keeping things cold bad candidates for the actual manufacture of chocolate due to melting concerns. It is for this reason coupled with protectionist trade policies that little chocolate is manufactured in Ghana. Kuapa Kokoo’s cocoa is turned into chocolate by a separate company to whom they sell their cocoa. A small number of these companies dominate the complicated chocolate manufacturing step of the supply chain and create a major choke point that makes it difficult and normally impossible to track a chocolate bar all the way back to the farmer or even region where it was produced. Kuapa Kokoo is unique in that it owns a significant share of a chocolate company called Divine (45% ownership of Divine UK and 33% of Divine USA). 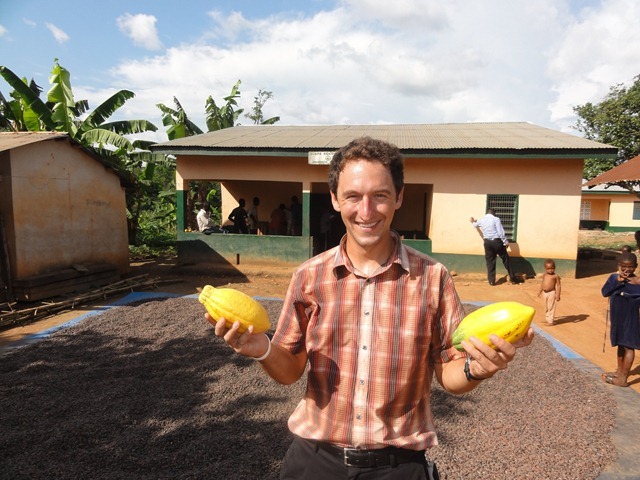 The farmers take great pride in this ownership, despite the fact that most of them have never tasted Divine chocolate as it is not sold in Ghana (happily the 3,000 attendees of Kuapa Kokoo’s AGM last year all had the opportunity to finally try it). In addition to the pride of ownership, the farmers also receive dividends as a result of their ownership. So the best case for Kuapa Kokoo would be if they could sell 100% of their cocoa as Fair Trade certified to Divine. Unfortunately the average percentage is somewhere well below 10%, with the remainder of the beans either sold as Fair Trade certified to windup in someone else’s certified chocolate bar (still good, as they receive the social premium), or unfortunately cannot be sold as Fair Trade at all (until our campaigning back home increases demand for Fair Trade enough). Note that Divine chocolate can be found at stores in Canada and it’s awesome! The easiest place to get it is probably Ten Thousand Villages or at Capers / Whole Foods too… The design on the wrapper of the chocolate bar are traditional West African Adinkra symbols (same as on the header of my blog). 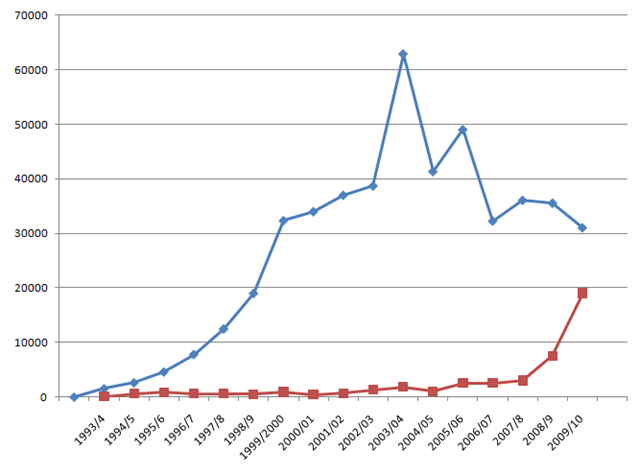 Last year, Kuapa Kokoo’s percentage of sales that were Fair Trade certified jumped up to 21% and this year’s are projected to be 61% (red line in the graph above is fair trade versus the blue line that represents their total production). The spike is due almost entirely to a contract with Cadbury, who have switched their popular Dairy Milk bar to Fair Trade certified chocolate in many countries, including Canada. Whatever you think of Cadbury (check out Carol Off’s book Bitter Chocolate), it is pretty clear based on conversations with members of Kuapa Kokoo that their current actions will have a positive effect on the poor farmers in Ghana. For Kuapa Kooko, selling to Cadbury isn’t as good as selling all of their product through Divine, as they do not receive owner’s dividends and they are exposed to the risk of Cadbury switching suppliers (they are currently developing 100 of their own certified communities in Ghana and may eventually prefer to have direct control over their entire supply), but the cooperative is very happy with the huge increase in the amount of their cocoa they are able to sell as Fair Trade certified and the resultant additional social premiums. Last year was a challenging one for Kuapa Kokoo. There were some issues with child labour on farms during their certification audits, which resulted in a big push to put into place improved internal structures, monitoring and reporting. These appear to be typical challenges associated with a growing organization and child labour is a very complicated topic in cocoa production, as almost all of the Kuapa Kokoo members are small family farms run by parents who are accustomed to having their children contribute on the farm. Fair Trade does not limit all child labour, but it does require compliance with ILO (International Labour Organization standards and strictly limits what children of different ages are allowed to do on the farm. So the focus of Kuapa Kokoo right now is to continue improving its infrastructure to ensure compliance with Fair Trade regulations, continue providing excellent value to its current members, and then grow in a controlled manner so that they can help more farmers. They are also investigating other large multi-national buyers in order to minimize the risk of being overly dependant on Cadbury or any one buyer. 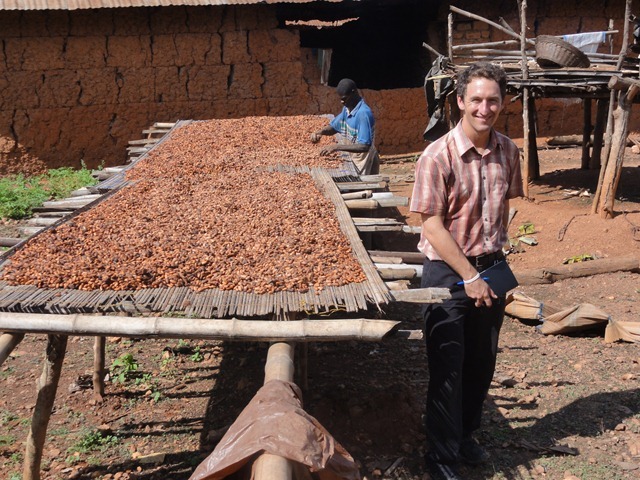 Our tour left me more excited than ever about the potential for Fair Trade to have direct impact on the lives of farmers in developing countries and about our power as consumers in Canada to make a difference, as the biggest constraint is definitely demand. The most exciting part of the tour was seeing the sense of empowerment and pride that members of the cooperative exhibited, as for me this is what development is all about. Looks and sounds amazing Mark. I love the photo’s and the amount of information you took in and passed on with first hand experience and interviews. Just fantastic to hear, and the projected sales increase up to 61% is unthinkable. Glad you made it to this cooperative and we will make sure to share this story! Fascinating! Thanks so much for bringing chocolate alive like never before. Fair Trade chocolate, coffee, sugar and bananas are pretty widely available where I live. I will keep an eye out for Divine chocolate. Great post! It’s really nice to hear the story of Kuapa Kokoo from your firsthand experience as I’ve only read about it before. 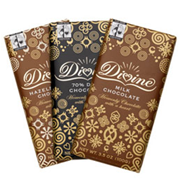 We sell Divine chocolate in my shop and now I can tell my customers a little more about it. 🙂 Interesting to hear that at the end of the day, the same farmers see the impact of Fair Trade through both Divine and Cadbury. Love reading about your work and experiences there – all the best! Thanks for this post Mark! Back in Canada we’re about to run our Reverse Trick or Treat campaign and we were able to increase demand and distribution by about 350%! So we’re seeing real demand in Canada to buy Fair Trade chocolate and almost not enough supply. We think we can address this next year and I hope that it can continue to support Kuapa Kokoo! Great post! Fantastic post, Mark! Well done! If you’re ok with it, I’d like to post this on the TransFair website and possibly include it in the next newsletter (let me know). One quick correction, the Fair Trade Minimum Price for cocoa was recently increased to US$2,000 and the Fairtrade Premium is now US$200. There’s a meeting later this month to sort out the prices for organic cocoa.